Later, on a visit to her childhood home in New England, she traipsed through the backyard and a thicket to the pond on which she had fished on lazy summer afternoons. She was astonished. It was so choked with vegetation that it looked more like a meadow than a pond. 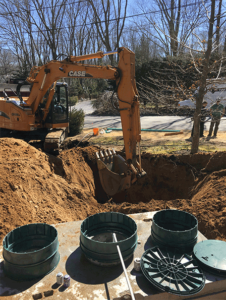 Groundwater contamination from aged septic systems was the culprit. Thus began the journey to the design and development of an advanced wastewater treatment unit. Virginia immediately tapped the engineering expertise of her Adelante colleagues Joe English and Jennifer Pope, and together they launched technical, economic, and legal assessments of the feasibility of designing a simple, reliable, and affordable residential wastewater treatment system that produced a discharge clean enough to be put to beneficial reuse. The results of all three assessments were favorable, and Adelante began the process of system design. Adelante spent the next decade, and then some, on concept development and testing, and then on product development. Many prototypes and modifications were made along the way to create today’s Pugo Systems. Pugo Systems was installed in Comox, BC and underwent rigorous NSF/ANSI testing to gain NSF/ANSI 245 for Wastewater Treatment Systems – Nitrogen Reduction. The purpose of this Standard is to establish minimum materials, design and construction, and performance requirements for residential wastewater treatment systems providing for nitrogen reduction. In March 2016, Pugo Systems attained National Sanitation Foundation/American National Standards Institute (NSF/ANSI) Standard 245 certification. Under a rigorous six month testing period conducted under the provisions of NSF/ANSI Standard 40 testing for residential wastewater treatment systems and concurrent Standard 245 testing for nitrogen reduction, Pugo Systems was successful in passing both tests with total nitrogen reduction greater that 50% and a total nitrogen median value of 17 mg/L. Coastal pollution from excessive nitrogen due to wastewater disposal on Long Island is contributing toward toxic algal blooms, oxygen-deprived waters, the loss of sea grass and wetlands, and the depletion of shellfish populations and fish kills. In an effort to address Suffolk County’s nitrogen pollution crisis, the county introduced the Reclaim Our Water initiative, a comprehensive plan to improve the region’s water quality by reducing nitrogen pollution through the implementation of advanced on-site wastewater treatment systems in targeted areas. Pugo Systems was selected to participate in the second phase of an I/A OWTS demonstration program.